Need a gift for your furry friend? 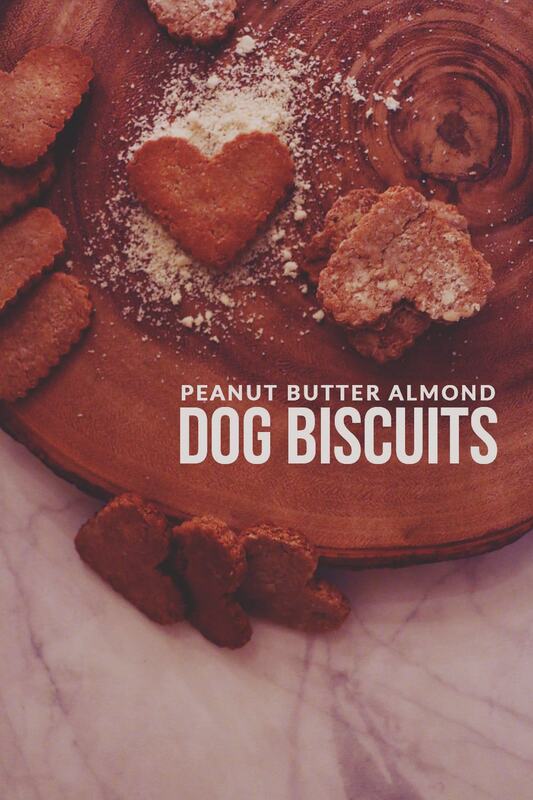 Make these deliciously easy Peanut Butter Almond Dog Biscuits! You’ll never need store bought treats again! Christmas is coming and I can just imagine how sweet the house will smell once it’s closer. Between the baked breads and the indulgent desserts, there’s no greater aroma that fills our home. We love to make homemade gifts for the holidays so we tend to spend extra time in the kitchen leading up to the family-filled holiday. Desserts, dried goods, canned goods and more fill our gift bags so our loved ones are always going home with even more to eat than what they had in our home. This goes for everyone we gift, including our furry friends. Sookie is a huge fan of homemade dog biscuits so she gets some extra special goodies this time of the year. She loves bacon and peanut butter so we try to make sure she gets something extra nutty or meaty in her stocking. 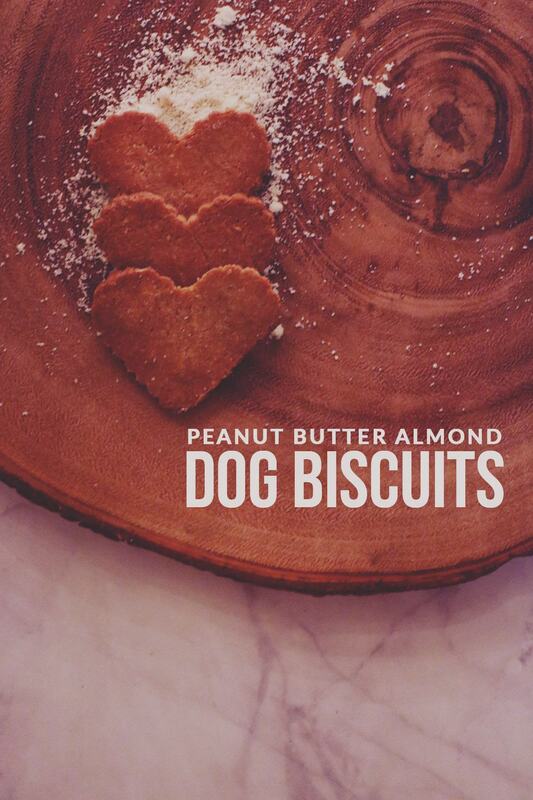 And these peanut butter almond dog biscuits are perfect. They’re quick to make and delicious for her to eat. I won’t lie – I tried them. They’re super bland, which is great for her, but definitely a no-go for me! One of the reasons I love making these is because they use food that we always have on hand, especially when it comes to baking season. 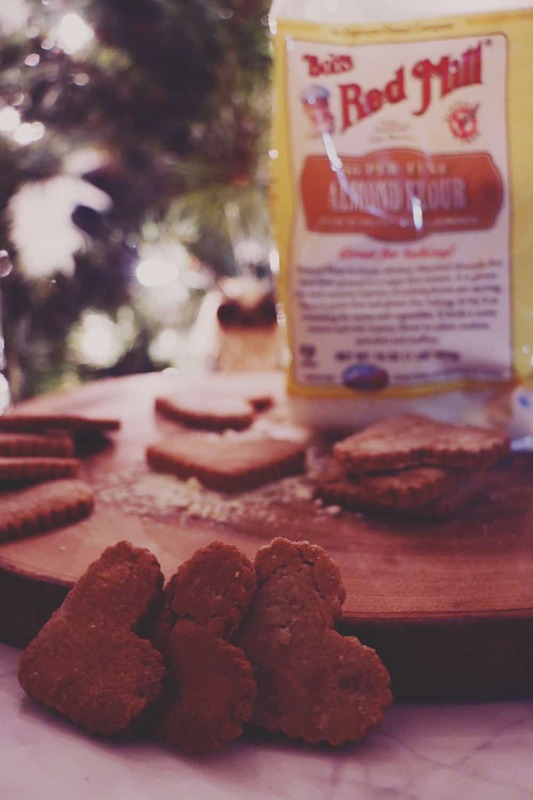 We love using Bob’s Red Mill All-Purpose Flour for our homemade treats, but we tested out the Organic Almond Meal/Flour for Sookie’s biscuits. The nutty aroma paired perfectly with the peanut butter and cinnamon to make our house smell SO good. 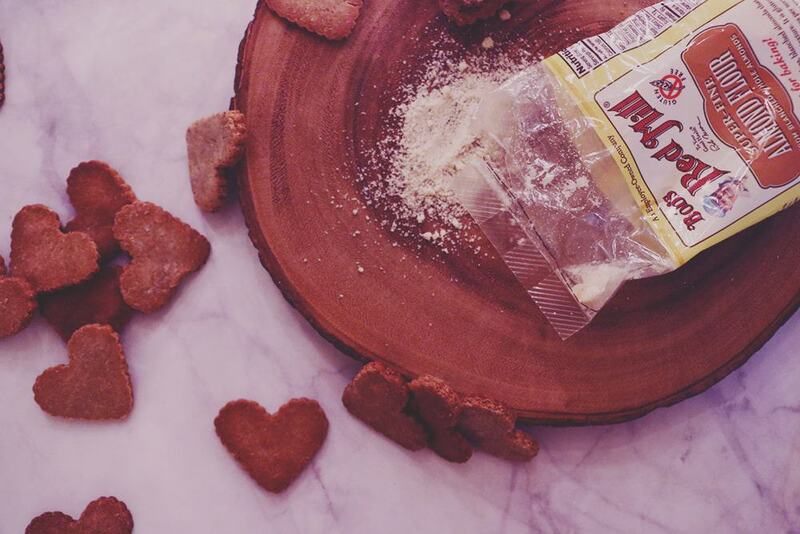 The Bob’s Red Mill Organic Almond Meal/Flour is ground from whole, blanched sweet almonds and provides a healthy protein boost that’s inherently gluten free. I can’t wait to use this for loved ones who enjoy indulging, but need something gluten free. And hey! 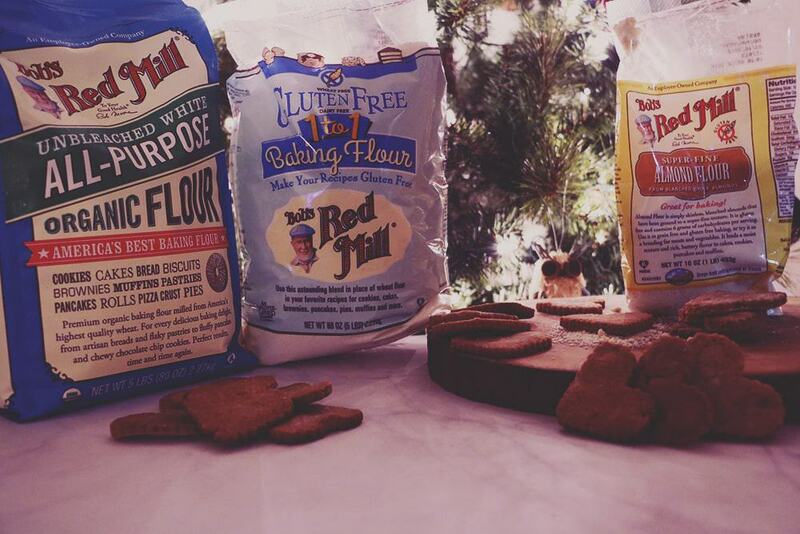 If you’re doing holiday baking like we are, be sure to snag this coupon. These dog biscuits include only ingredients we would eat ourselves so I know it’s good enough for her. Her stocking will be filled with them this year and I already know she won’t be complaining! Combine all of the ingredients and roll into a ball. Roll it out into about a 1/4" thick slab and use a cookie cutter to cut the biscuits out. Place biscuits on a slightly greased cookie sheet. Bake for 18-22 minutes or until slightly browned and hard. Let cool and serve to your pup! If the dough is too wet, add more flour. If it's too dry, add water 1 tsp at a time. Great post! I fully believe the pups should get to have holiday cookies too! Your post came at the perfect time. I was just thinking about making some treats for my pup. 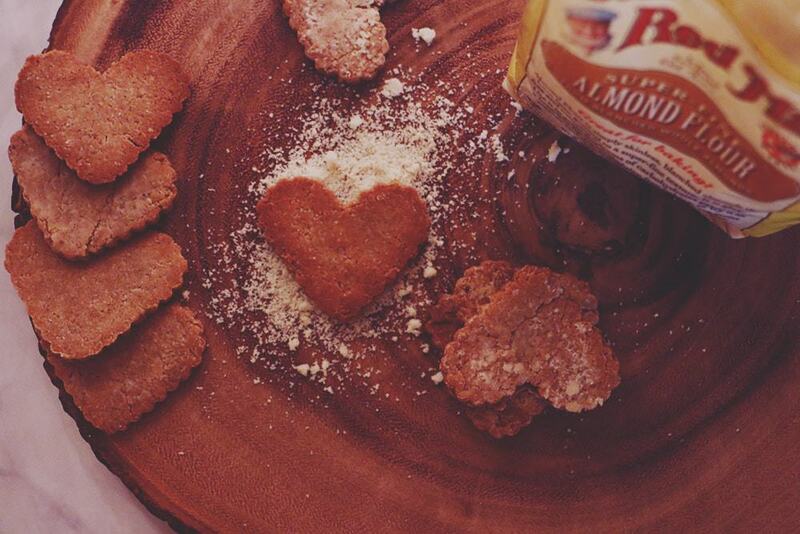 Such a fun idea to make homemade dog biscuits! I’m sure they would be well received by furry friends. My dogs would love these!! They both love peanut butter. I’ll have to make these soon! Thank You for sharing this! You always have THE BEST doggie treat recipes! Keep ’em coming! I’ve definitely got to save this recipe for Hunter. He loves homemade dog treats! I’ve made him treats with coconut flour in the past. I’ll have to try the almond flour! My dogs would completely devour these! I’ll have to make these for my dogs. They would love them! Thanks for sharing! These sound super fun to make! I’m sure my pups would love to have them in their stockings for Christmas! I thought dogs weren’t supposed to have almonds/almond flour? Hi Molly! Overall, whole almonds aren’t recommend for dogs as they can be a choking hazard (http://canigivemydog.com/almonds) but they are safe to use as a grain free flour (https://pets.thenest.com/types-flour-dog-biscuits-11966.html) for dog treats. We try to change up the treats we make for her/give her so she’s not regularly consuming anything that isn’t specifically nutritious for dogs.